A free concert in Aotea Square, Auckland, to celebrate the end of the 1984 academic year turned ugly when riot police attempted to arrest a drunken man who urinated on the crowd from a roof. Members of the audience resisted the police, who decided to close down the concert. 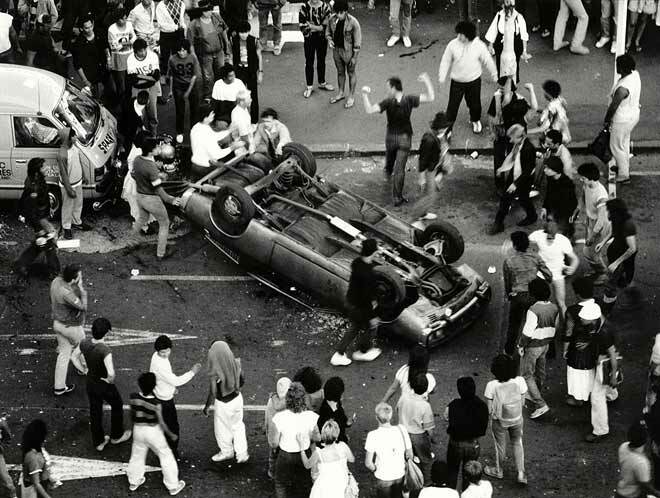 Matters soon got out of control, and rioters – such as these young men overturning a car – caused more than $1 million worth of damage. Dave Dobbyn, lead singer of DD Smash, allegedly told the crowd at the outset, 'I wish those riot squad guys would stop wanking and put their little batons away.' He was later cleared of the charge of inciting the riot.